Munizae Jahangir and others during UN HRs event in New York. NEW YORK/ ISLAMABAD (ENN) Legend Pakistani human rights leader and lawyer Asma Jahangir has been awarded the United Nations’Human Rights Prize 2018. The prize was awarded to Jahangir, who passed away on February 11 after suffering a stroke at the age of 66. 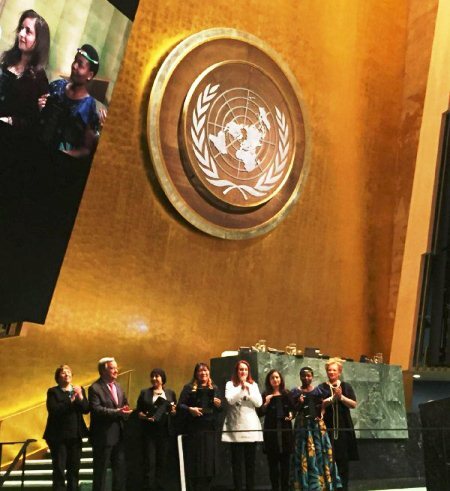 The award on Wednesday was received by her Journalist daughter Munizae Jahangir at a ceremony held at UN General Assembly New York as part of activities to celebrate International Human Rights Day. A large number of diplomats, human rights activists and senior UN officials attended the ceremony. The Human Rights Prize is awarded every five years,in accordance with a resolution of the General Assembly that was adopted in 1966. 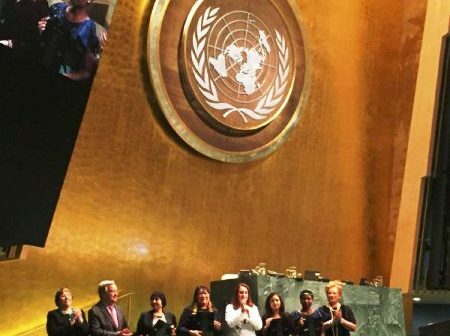 Munizae Jahangir in her tweet wrote “The ceremony at the UN General Assembly begins in New York to announce the 2018 winners of the prestigious United Nations Prize in the Field of Human Rights. Apart from Asma Jahangir other winners are Rebeca Gyumi – activist for the rights of women and girls (Tanzania)”. Asma was known for taking up court cases of victimised and marginalised sections of society, as well as for speaking against human rights violations and her courageous stand against the military rule of General Zia. Asma was a vocal opponent of judicial overreach and would often confront the superior judiciary when it would extend its jurisdiction in her opinion. She spoke what others could not say openly in Pakistan.